Sodium peroxide is the inorganic compound with the formula Na2O2. This yellowish solid is the product of sodium ignited in excess oxygen. It is a strong base. 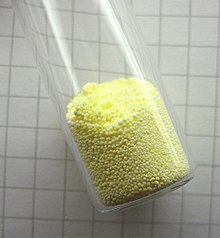 This metal peroxide exists in several hydrates and peroxyhydrates including Na2O2·2H2O2·4H2O, Na2O2·2H2O, Na2O2·2H2O2, and Na2O2·8H2O. The octahydrate, which is simple to prepare, is white, in contrast to the anhydrous material. Sodium peroxide crystallizes with hexagonal symmetry. Upon heating, the hexagonal form undergoes a transition into a phase of unknown symmetry at 512 °C. With further heating above the 675 °C melting point, the compound decomposes to Na2O, releasing O2. The octahydrate is produced by treating sodium hydroxide with hydrogen peroxide. It may also be produced by passing ozone gas over solid sodium iodide inside a platinum or palladium tube. The ozone oxidizes the sodium to form sodium peroxide. The iodine can be sublimed by mild heating. The platinum or palladium catalyzes the reaction and is not attacked by the sodium peroxide. Sodium peroxide was used to bleach wood pulp for the production of paper and textiles. Presently it is mainly used for specialized laboratory operations, e.g., the extraction of minerals from various ores. Sodium peroxide may go by the commercial names of Solozone and Flocool. In chemistry preparations, sodium peroxide is used as an oxidizing agent. It is also used as an oxygen source by reacting it with carbon dioxide to produce oxygen and sodium carbonate; it is thus particularly useful in scuba gear, submarines, etc. Lithium peroxide has similar uses. ^ a b Zumdahl, Steven S. (2009). Chemical Principles 6th Ed. Houghton Mifflin Company. p. A23. ISBN 0-618-94690-X. ^ Greenwood, Norman N.; Earnshaw, Alan (1984). Chemistry of the Elements. Oxford: Pergamon Press. p. 98. ISBN 978-0-08-022057-4. ^ Harald Jakob, Stefan Leininger, Thomas Lehmann, Sylvia Jacobi, Sven Gutewort "Peroxo Compounds, Inorganic" Ullmann's Encyclopedia of Industrial Chemistry, 2007, Wiley-VCH, Weinheim. doi:10.1002/14356007.a19_177.pub2. ^ Tallman, R. L.; Margrave, J. L.; Bailey, S. W. (1957). 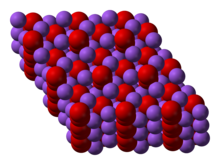 "The Crystal Structure Of Sodium Peroxide". J. Am. Chem. Soc. 79 (11): 2979–80. doi:10.1021/ja01568a087. ^ a b c Macintyre, J. E., ed. Dictionary of Inorganic Compounds, Chapman & Hall: 1992. ^ a b Lewis, R. J. Sax's Dangerous Properties of Industrial Materials, 10th ed., John Wiley & Sons, Inc.: 2000. ^ a b E. Dönges "Lithium and Sodium Peroxides" in Handbook of Preparative Inorganic Chemistry, 2nd Ed. Edited by G. Brauer, Academic Press, 1963, NY. Vol. 1. p. 979.